Foreign construction companies are showing particular interest in construction of the shipping channel in Istanbul, the Turkish Ministry of Transport and Infrastructure told Trend Feb. 7. The preparation of the shipping channel construction project in Istanbul has been completed, according to the ministry. “The Istanbul shipping channel construction project is one of the most important projects,” the ministry said. The intention to implement the project of construction of the Istanbul shipping channel was announced for the first time in 2011 by the current President of Turkey Recep Tayyip Erdogan. The length of the shipping channel in Istanbul will be 43 kilometers, and in the framework of the construction project, a special authority will also be created in order to control the operation of the channel after its commissioning. The purpose of the construction of the Istanbul channel is to reduce the burden of shipping on the Bosphorus Strait, as well as to prevent the threat of environmental and man-made disasters on one of the most intense sea routes in the world, the ministry said. The width of the Istanbul channel, according to plans, will be 400 meters, and its depth - 25 meters. The channel will be able to let pass 150-160 vessels per day. Currently, the Bosphorus is used by an average of 150 vessels per day, of which about 30 are oil tankers. 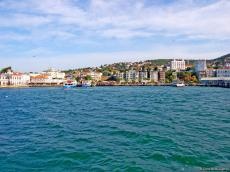 Annually about 150 million tons of oil and oil products are transported through the Black Sea Straits, while the throughput capacity of the Bosphorus is estimated at 200 million tons. The Istanbul channel will run parallel to the Bosphorus and will actually make the European part of Istanbul an island and finally separate it from Europe. The channel will pass from the Black Sea to the Marmara Sea through the Kucukcekmece Lake. On the banks of the artificial channel, it is planned to build new residential complexes, which will be connected with other areas of the 15 million metropolis thanks to modern transport infrastructure, including metro and high-speed trains, as well as with the third airport in Istanbul. As part of this project, the construction of a new port is also expected. It will be possible to use tankers with a length of 275 meters, a width of 48 meters and a capacity of 14,500 DWT on the Istanbul shipping channel, which is being built as part of the government’s “Vision 2023” plan. The construction of the navigable channel will continue for five years and the minimum service life of the canal will be 100 years. The official exchange rate for Feb. 7 is 5.2183 TRY/USD.